Have You Heard About The….? For a long time, word of mouth was the original reputation maker or breaker. If you live by the opinions of others like I do when it comes to selecting a new restaurant, service provider, or product – online reviews are the today’s word of mouth. According to a 2013 ZenDesk survey, 90% of Customer buying decisions are influenced by reviews either positive or negative. 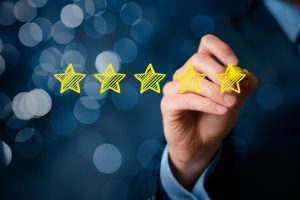 As a small business owner, online reviews could be the difference between scraping to get clients or having a thriving practice with a steady organic business growth through consistent referrals. At the Academy, we think of referrals as individuals coming from someone that has personally recommended you. If someone came to your business and reported that they had a poor experience back to that original referring party, chances are you’d be hard-pressed to figure out where things went wrong and try to course correct – if not to salvage the prospect, to make sure things are whole with that referring party. If online reviews are a way to more or less recommend one’s service or product, then isn’t that, in essence, a referral too? If you’re following my train of thought on this, then why is it that we don’t put the same care and effort into making things right for anyone who leaves us a less than stellar review or thanking those who are raving fans? 1. Set a Google Alert for your firm. Anytime your firm is mentioned, you will get an email, positive or negative. a. For negative reviews, draft your response using these tips. iv. Most importantly – never blame the reviewer! b. For positive reviews, you have a little more flexibility in your response but should generally include these points. 3. Send your draft to someone who was uninvolved with the interaction to look over before you post. 4. Post your response. Keep in mind, you may need to go through the steps to claim your business first before you post. Responding to reviews lets prospects know that you aren’t in it for the transaction. This is your livelihood and you are a professional business owner that takes pride and care in the service provided. Make the time to manage your brand – letting your reviews go idle is no longer an option if you want your business to continue to grow by word of mouth.